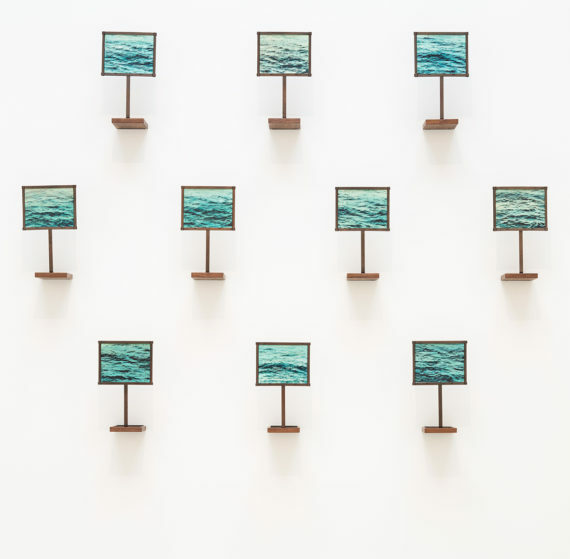 Curated by Christine Macel, this year's International exhibition at the Venice Biennale is conceived as a series of nine 'pavilions' that span the Giardini and Arsenale sites. Pippa Koszerek finds thoughtful inquiry in an exhibition that at times can feel muddled and historically naive. How to approach a review of a biennale exhibition so wide and varied as Christine Macel’s ‘Viva Arte Viva’ for the 57th International Art Exhibition of the Venice Biennale? Laid out as a series of chapters that group together artists ‘as families’ of practice, Macel has loosely conceived these as a series of nine pavilions that are each an expanded definition of their respective title. Themes from one pavilion continue to appear in others throughout the exhibition. 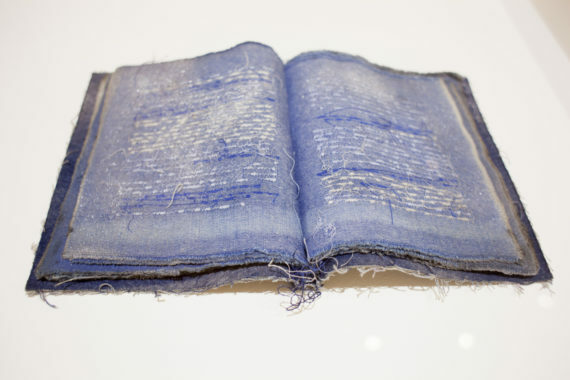 Maria Lai, whose textile pieces in the Arsenale explore collective memory through abstract scripts and mappings on canvas and in book form, could easily be in the Pavilion of Artists and Books, or Pavilion of Colors – or most of the nine pavilions for that matter. It is her early, pre-relational aesthetics approach to participatory practice, in particular her 1981 collective performance, Legarsi alla montagna, that has situated her in the Pavilion of the Common. Sardinian folklore weaves its way through much of Lai’s practice; her large stitched canvases and sumptuous, glistening books with their unreadable codas evoke a thirst to know the unknowable. The boundaries and geographies of these artistic pavilions are purposefully fluid, a contrast to many of the national pavilions of the Giardini and Arsenale. After all, ‘Viva Arte Viva’ isn’t really about a series of segmented categories. For Macel, the exhibition is an exploration of humanism through art. Unlike a lot of contemporary art, irony does not feature strongly in Macel’s selection which at times contains an element of historical naivety, such as by featuring an Amazonian tribe on display in the Pavilion of Shamans. Kindness, generosity, reflection, experimentation and a sense of adventure interweave from one work to another, whether it is Lai’s artistic muse, the Jana – legendary benevolent fairies who weave Sardinia’s collective memory – or Koki Tanaka’s four-day journey from his home in Japan to his nearest nuclear power station. Tanaka’s film is an exercise in empathy as he puts himself in the shoes of those who lived near Fukushima. Although he lives in Kyoto, he is only 60km away from his nearest nuclear plant. Should an accident occur, a radius of 20km would be immediately closed off. How far and how safe are you from your nearest potential accident zone, he asks the viewer. The last two biennales made bold use of the spaces in the International exhibition, pairing large-scale sculptures and installations with carefully spaced works that took the viewer on a journey through the galleries. 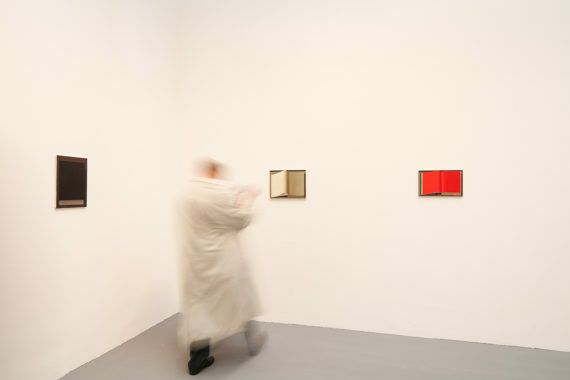 Macel has conceived of her edition as a book that unveils its content onto the white walls and within the galleries and outdoor spaces of the Giardini and the Arsenale. 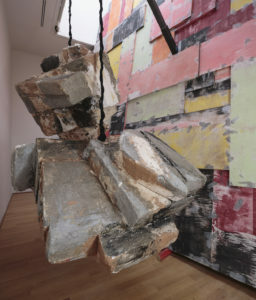 In doing so, it’s as if she hasn’t considered the uniqueness of the venue, instead creating a series of loosely defined sections that are at times interrupted as one work runs into another. The Giardini’s Central Pavilion hosts the Pavilion of Artists and Books, and the Pavilion of Joys and Fears. 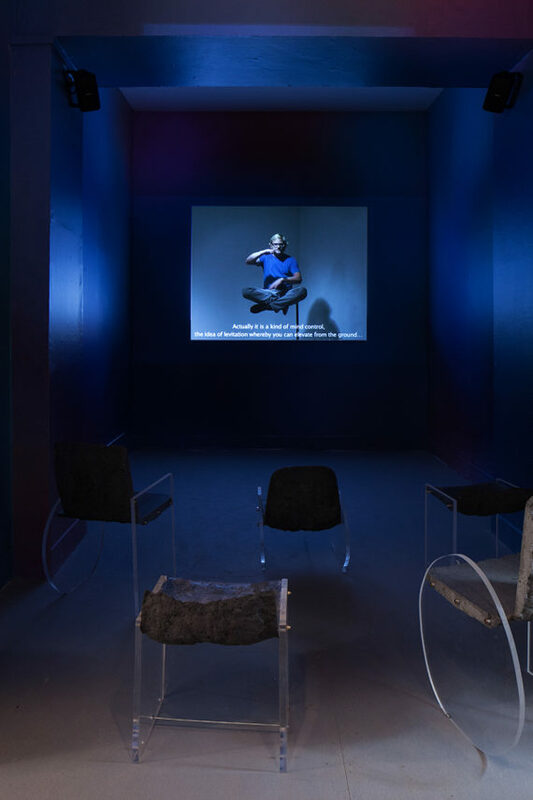 In the former, Søren Engsted’s video of himself giving an artist’s talk while levitating is accompanied by a series of sculptural chairs – concrete seats on transparent legs. The uncertain phenomenological experience of sitting on these sturdy yet seemingly fragile seats creates a relationship between the viewer and the on-screen Engsted, whose Indian levitation chair allows the artist to become a clownish figure as he relates anecdotal history about flying. Moving out of the Central Pavilion’s initial, rather confined spaces, the work of Liu Ye and Abdullah Al Saadi sit well alongside each other. Ye’s paintings of blank book covers and blank open pages instil a sense of calm while speaking of censorship and hidden knowledge. The Chinese artist’s father was a children’s book author at the time of the Cultural Revolution and the importance of literature comes through in the stark simplicity of Ye’s canvases. Likewise, the hidden scrolls that make up Al Saadi’s diaries, inventively concealed within an array of tins, infer strategies and meanings that go beyond their reference to the discovery of the Dead Sea Scrolls. Joy and fear echo through the works of Hijra Waheed and Rachel Rose, in keeping with the title of the pavilion their work is part of. With room to breathe, Waheed’s exhibition of exquisite oil paintings on tin, gouache on masonite, and hundreds of negative glass slides convey an ambiguous narrative of migration and geography. Peaceful and destructive in turns, the seductive oil paintings contain a sense of ominous foreboding. Rose’s vivid animation of a domestic animal venturing into a suburban wilderness could be an analogy for the current sense of unknown in our wider geopolitics – a domestic scene becomes that of a catastrophe. Books – in particular the uncovering of knowledge and alternate histories – are a recurring theme throughout Macel’s nine pavilions. Information-heavy at times, the Arsenale begins with the Pavilion of the Common, positing a shared history between the lesser-known participatory rituals of the American Anna Halprin, the French and Spanish collaborative quartet Antoni Miralda / Joan Rabascall / Dorothée Selz / Jaume Xifra, and the Paris and Bogota-based artist Marcos Ávila Forero. It continues through to the Pavilion of Time and Infinity, where Edith Dekyndt and Alicja Kwade magically complete the viewer’s journey through the artery of the Arsenale. Dekyndt’s use of transient materials such as dust or silver leaf results in sculptures of beauty and profundity. Conveying immensity and weight, her silver leaf-covered curtain is a mountainous backdrop to the immeasurably light rectangle of dust on the floor, lit by a moving projector. 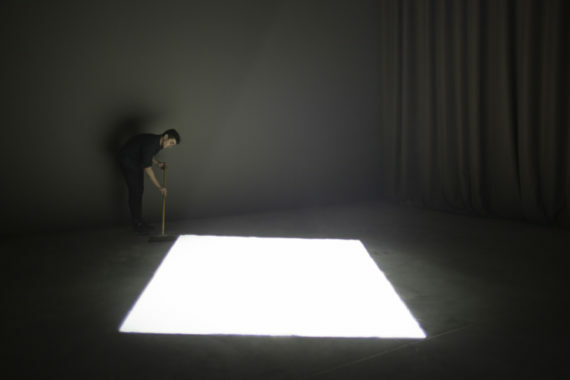 As the light slowly moves, a performer delicately sweeps the dust in order to keep the shape illuminated. Kwade’s walk-through installation, WeltenLinie, also transforms the objects within it. Reflected and mirroring each other, they become greater than their individual parts – a sense of wonder and calm pervades. Macel’s show does not contain the majesty of Massimiliano Gioni’s 55th or Okwui Enwezor’s 56th International exhibitions, which each took full advantage of the architecture and scale of the Arsenale. Preferring a different curatorial approach, Macel privileges an archival and art historical overview of the artworks that doesn’t always lend itself to the specificity of the exhibition spaces they occupy. 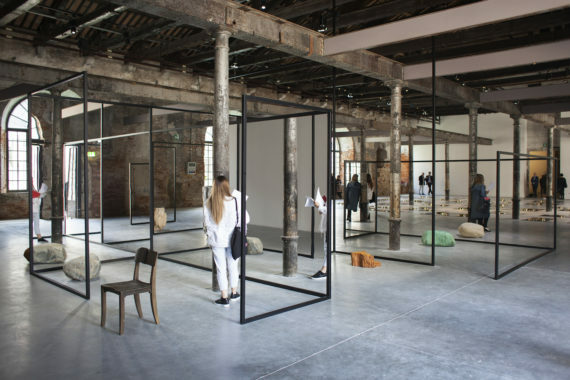 While some works within the exhibition find it hard to breathe, perhaps better suited to a more intimate exhibition space, along with Dekyndt and Kwade a number of installations fill the Arsenale to its height, successfully managing their presence in terms of space and content. Frank Erhard Walther, winner of the Golden Lion for the Best Artist of ‘Viva Arte Viva’, presents brightly coloured rectangles of fabric that require a human body – preferably the audience – to complete the work. 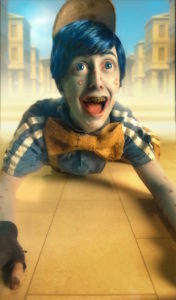 Beyond the Golden Lion (and the special mentions for Charles Atlas and Petrit Halilaj) my winners of ‘Viva Arte Viva’ are the video pieces. Provided with their own black box spaces, these can be contemplated for what they are, away from the hubbub of the other works. Conjuring the landscape of the Venetian islands and set in the magnificent salt flats of Bolivia, Chilean artist Enrique Ramírez in the Pavilion of Shamans makes us reconsider our own feelings and beliefs about mortality. A masked figure slowly walks out to sea, pulling a train of suits behind him, their fabric becoming layered with the salt surface. Reminiscent of burial rituals and processions, a male narrator speaks of his journey towards death, explaining that he has fulfilled all he was instructed to do. Other video gems from Taus Makhacheva, Guan Xiao, Ayrson Heráclito, Jeremy Shaw, and Hale Tenger – at turns hilarious, exhilarating or sublime – are welcome pauses at distinct points within the exhibition. Slow to grow on you, ‘Viva Arte Viva’ at first seems like a muddled exhibition. But as you pass from pavilion to pavilion, it gradually reveals itself to be a thoughtful inquiry into the transgressive and healing potential of artistic practice. 4. Hajra Waheed, Various works, 2014-2017, mixed materials, 57th International Art Exhibition, Venice Biennale 2017.